Most people familiar with Palestine are familiar with the work of Naji al-Ali, the creator of Hanthala. The cartoon of a ten-year-old refugee boy facing away from us, his hands behind his back, is the ubiquitous visual symbol of Palestinians expelled from their homeland and living in camps, silently witnessing the tragedies of Palestinian life since 1948. You can find al-Ali's iconic drawing spraypainted on walls not just around the Arab world but in European and American cities, as a pendant worn around the neck, on tee-shirts, sewn into keffiyehs, animated and all over the internet, and, just for example, on a cut-out sheet of paper taped to the back of the laptop on which I write this essay. Within Palestine and the Palestine solidarity movement internationally, Naji al-Ali's presence is equal perhaps to that only of Mahmoud Darwish as a cultural unifier and voice for the voiceless. So it is shocking to consider that it is not until now, 22 years after al-Ali was assassinated in London (he was shot by unknown assailants on July 22, 1987) and more than 48 years since he was first published by Palestinian author Ghassan Kanafani, that the first English-language collection of his cartoons is making its appearance. Despite several online galleries, tracking Hanthala down in print in the West has been quite difficult. Therefore we can all thank and praise the editors of Verso Books for their decision to create a slender introduction to al-Ali's graphic work for the Angolphone world. They have selected 100 cartoons and arranged them roughly by theme in five chapters: Palestine; Human Rights; US Dominance, Oil and Arab Collusion; the Peace Process; and Resistance. There is a brief introduction to each chapter, and each cartoon is accompanied with a short caption providing translation and explanation. 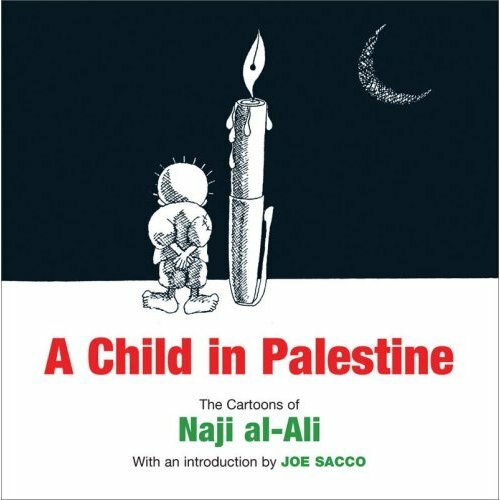 The whole book is furnished with an introduction by cartoonist Joe Sacco, probably al-Ali's heir as the single person most associated with the crossroads of Palestine and comics. 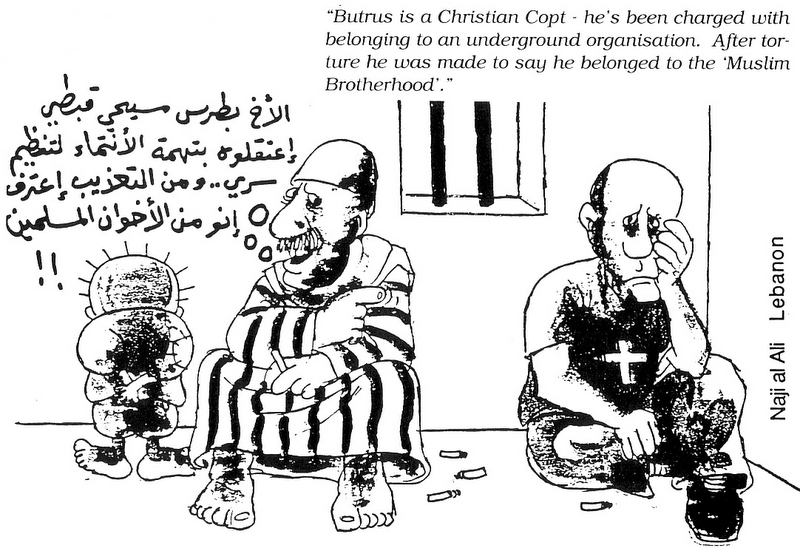 The work itself is as powerful as one can imagine for a cartoonist who's voice was so threatening to those in power that he had to be silenced with bullets. These are not funny cartoons, not even in the sense of the droll sarcasm associated with editorial cartoons in America. Al-Ali's work is replete with bloody struggle against ghoulish enemies; maimed bodies of children and bullet-ridden adults are wept over by wailing mourners under skies of solid inky black. It is frequently black night in Hanthala's world, without stars and only a crescent moon to see by. Bodies and landscapes transform surreally into bullets, keys, barbed wire, bombs. The leaders of the Arab world become grotesque slugs, fat and corrupt; the Israelis are vampiric goblins. The recurring representative of the "commoner," the Arab peasant or worker who becomes a militant is stabbed, hung, and shot all the while a little boy watches silently (usually). They are a cri de couer of horror and resolute endurance. Technically, al-Ali's line is usually called "simple" and at times even "crude"--shaky, without variation in weight, using cross hatching or grey ink wash to give the figures roundess and shading without detailed rendering. This style is not dissimilar to other cartoonists and animators internationally of al-Ali's generation working in the 60s and 70s, especially those associated with the underground or hippie movements in the West, like Fred Wolf or Bruno Bozzetto. But the power of al-Ali's work can be seen in the endless creative variation of the visual metaphors used. Recurring elements are recombined and reimagined to produce inventive new ways of reiterating al-Ali's consistent and unwavering message, which is as stark as his images. The Arab commoner (Palestinian, Lebanese, or other), man and woman, thin and starving, is faced with multiple enemies who are in fact in collusion: the U.S., the Israeli soldier, and the leaders and "fat cats" of the Arab world (whether dressed traditionally or in Western business suits), who will always betray the armed struggle that is necessary for Palestine to be reclaimed. 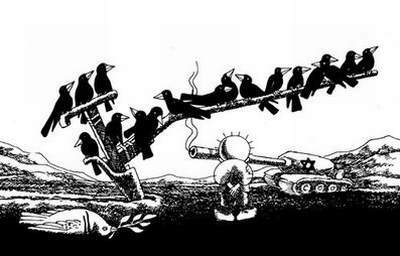 An analysis of the Arab ruler's simultaneous repression of their people, dependence on oil wealth and obeisance to the U.S. is neatly summarized in a single, striking, wordless composition. Al-Ali's images also provides a quick and easy way to debunk some common Western myths about the history of the struggle for Palestine. Human rights and democratic discourse were a part of Palestinian demands from the beginning, and were blocked by the Israelis. The objection to settlements is not new or recent, but dates to their inception in the 1970s, and from the beginning were recognized as an obstacle to peace by al-Ali. The Arab states and the leaders of the PLO are not "moderate" but in fact capitulate too readily to U.S. and Israel demands and have been doing so for decades. Still, one is left feeling that this book only represents the barest beginning for exposing al-Ali and Hanthala to English-speaking audiences. Obviously, 100 cartoons selected from a body of work that includes tens of thousands can only serve to pique the interest of those seriously interested in Naji al-Ali. Strangely, Verso did not credit an editor for this collection, nor is any explanation or rationale for the choice of cartoons given. 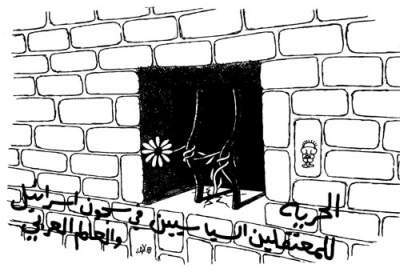 I know from browsing Arabic-language collections, for example, that many of al-Ali's cartoons do include much text and dialogue despite his reputation as a wordless cartoonist for largely illiterate masses. One can only presume that these cartoons were left out for ease of translation, but they are precisely the ones least accessible to the non-Arabic audience. More importantly, and disappointingly, there is no critical biography of al-Ali or attempt at cogent analysis. The written material, credited to Abdul Hadi Ayyad only in the copyright errata inside the book, is generic and prone to platitudes and hagiography, and no more informative about al-Ali's life or work than his Wikipedia entry (actually slightly less). Its attempts at translation and explanation for the cartoons frequently overdetermine what appears to me to be deliberate ambiguity of images. I am left feeling that one of the most influential and important cartoonists of the second half of the 20th century, of the non-English-speaking world, and of the global decolonization struggle, is still without a compendium that will be of use to more than casually interested audiences. One hopes that with enough interest in this book it will be forthcoming. Ethan Heitner is a member of Adalah-NY: The Coalition For Middle East Justice and a student of cartooning at the School of Visual Arts in New York. He has previously written for TomPaine.com and Cairo magazine. His cartoons will be available at www.freedomfunnies.com soon.